Cycle helmet use in Britain has increased significantly since the mid 1980s. This has come about largely due to the vigorous promotion of cycle helmets by Government, the medical profession and others as an effective and unequivocal means of reducing the severity of head injuries to cyclists. This paper looks at trends in cyclist casualties in Britain over the period when helmet use has risen from virtually zero to as much as 40 per cent or more in some parts of the country. It then looks at similar research that has been carried out in other countries to establish any similarities. 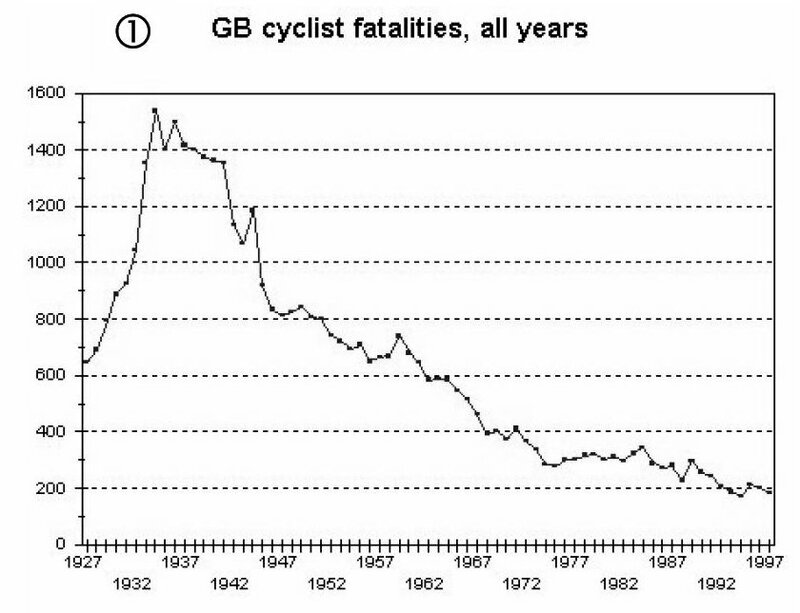 The total number of deaths to cyclists in Great Britain has been falling almost continually since 1934 (Figure 1), when there were a total of 1,536 cyclist fatalities. In 1997 the total was 183. A breakdown of other severities of cyclist injury is only available to the author since 1974, when there were 282 fatalities, 4,166 serious injuries and 18,900 slight injuries. 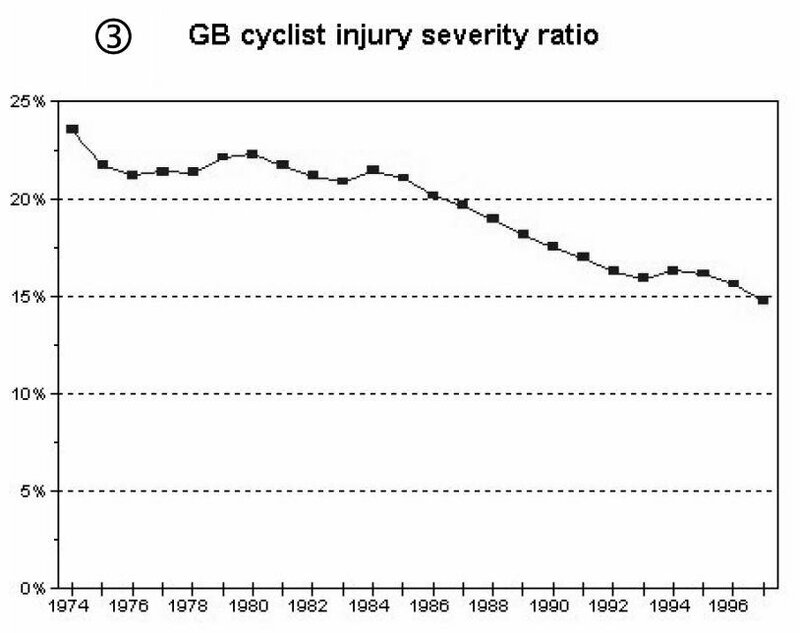 From 1974 the number of serious injuries rose until 1984 and has fallen steadily since (Figure 2). In 1997 there were 3,371 serious injuries. The number of slight injuries also rose until 1984, but since that time has remained steady at around 20,000 a year. The above statistics take no account of the number of people cycling. This number has fallen dramatically since the trend of declining fatalities started in 1934. A fairer way to assess trends in casualties irrespective of the number of people cycling is to look at the severity ratio: the proportion of cyclist casualties that involve fatal or serious injuries. Since 1974 (the first year for which full statistics are available) the severity ratio has fallen almost consistently (Figure 3), although the fall was arrested between 1993 and 1996. Until the mid 1980s helmet use was rare amongst British cyclists. Helmet use started to grow from about 1986 but take-up was slow for some years. By 1996, however, helmet use had risen to an average of 16% throughout Britain, and was about 18% in 1998. A growth of around 16% in helmet use over a decade is significant, and might be expected to result in a noticeable impact on recorded casualties to cyclists. However, for Great Britain as a whole, the trends in fatalities, serious injuries and severity ratio show no evidence at all of a 'helmet effect', in all cases trends continuing as they had prior to helmet use becoming more popular. Indeed, what change there has been in severity ratio would suggest that the proportion of serious injuries actually increased during the time of greatest helmet take-up. Greater London has probably the largest incidence of helmet use by cyclists in Great Britain. Over the decade to 1996, wearing rates rose from close to zero to about 40 per cent. As for Great Britain, the severity ratio provides a fairer way to assess trends independently of the number of people cycling. 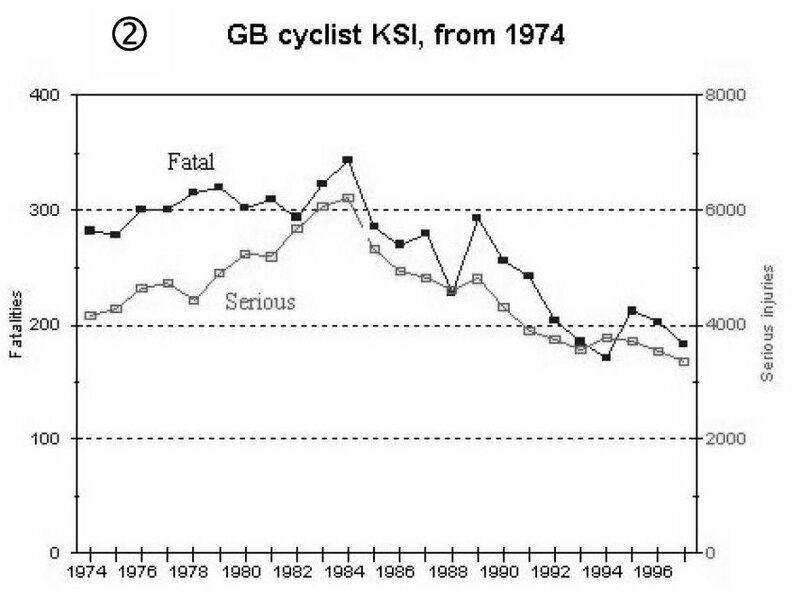 For cyclists (Figure 5) there has been no improvement on the severity ratio of the early 1980s and, indeed, the seriousness of casualties has increased since 1994. The trends in fatalities, serious injuries and severity ratio for Greater London show no evidence of influence by the increased wearing of cycle helmets. Indeed, serious injuries (both in total and as reflected by the severity ratio) increased noticeably during the period of greatest helmet take-up. It may, of course, be that some mitigating factor is cancelling out benefits achieved through helmet use. In this context it is instructive to consider the severity ratio in Greater London for pedestrian road casualties (Figure 5). This shows a trend very similar to that for cyclists. However, since 1985 the average seriousness of pedestrian casualties has decreased more than that for cyclists, and the severity ratio has not increased since 1994. Clearly, pedestrian trends have not been influenced by the wearing of helmets. Cambridge is the British city with the greatest amount of cycling. Helmet use by Cambridge cyclists had reached 33 per cent by 1998 – lower than in London, but still twice the national average. 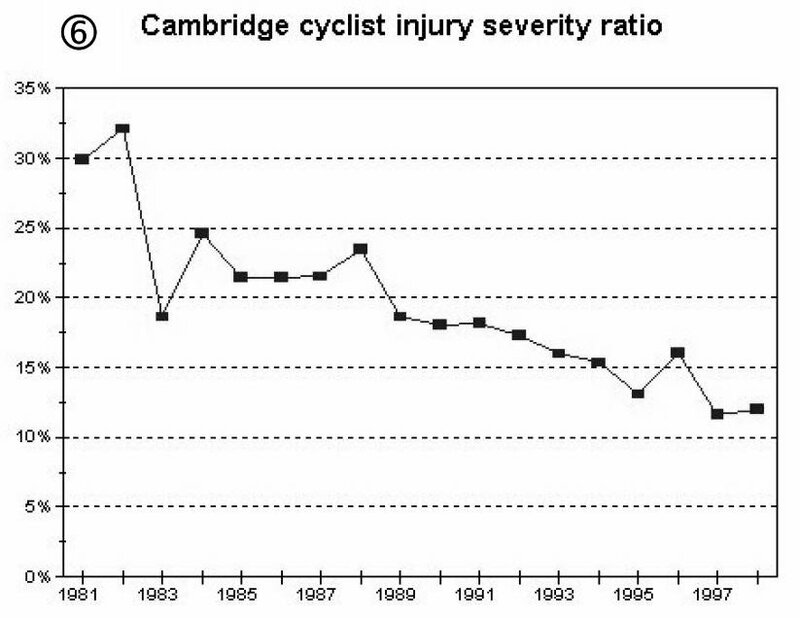 Fatalities in Cambridge have held steady since 1981, although numbers are very small at just 1 or 2 a year. Serious injuries fell by half from 1981 to 1998 and the severity ratio (Figure 6) has declined steadily for many years. Once more it is difficult to see any improvement in casualties or the severity ratio in later years that might be attributable to the large increase in the use of cycle helmets. The largest sample ever used in an assessment of the effectiveness of cycle helmets was made by Rodgers, 1988 when he studied over 8 million cases of injury and death to cyclists in the USA over 15 years. He concluded that there was no evidence that hard shell helmets had reduced the head injury and fatality rates. Indeed, he suggested that helmeted riders are more likely to be killed. A study by Kunich, 2002 analysed cyclist and pedestrian fatalities for the USA from 1986 to 1996, during which period cycle helmet use rose from close to zero to 30 per cent or more. Although cyclist fatalities fell during this period, the decline was proportionately less than for pedestrians, and the continuation of a long-term trend most probably associated with decreased exposure. Kunich concluded that there is no evidence that cycle helmets are effective in reducing deaths. Burdett, Can carried out a similar analysis for Canada from 1975 to 1997. 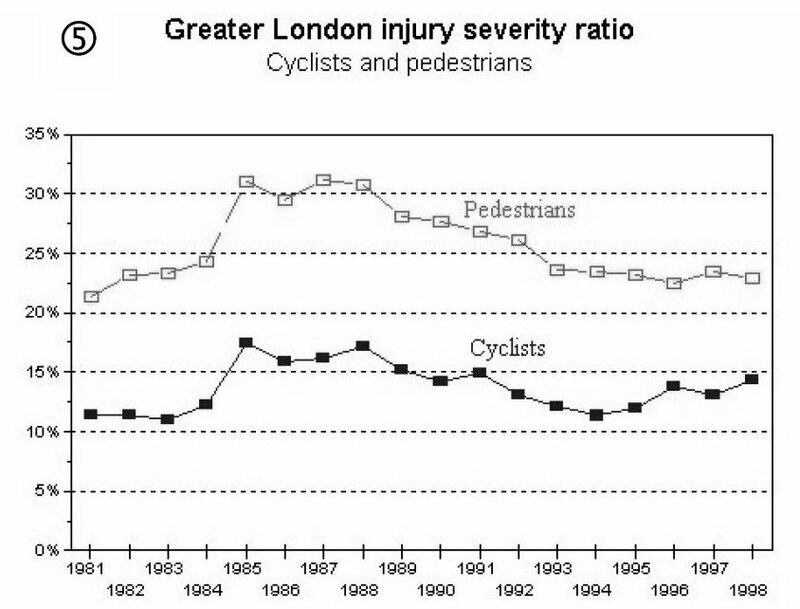 Fatality trends were similar for cyclists and pedestrians throughout the period, and both fell. Although cycle helmet use had risen to 50 per cent by 1997, there is no detectable impact on the fatalities recorded. In Australia, mandatory helmet laws from 1990 - 1992 provided a whole-population sample with which to assess the effectiveness of a large increase in helmet use. Early official studies claimed a success as head injuries declined significantly, but the studies failed to take account of the large decrease in cycle use brought about by the helmet laws or the concurrent trends in declining head injury across all road users. However, the Australian Road Accident Prevention Research Unit has subsequently reported (Hendrie, Legge, Rosman and Kirov, 1999) that head injuries since helmet use became compulsory may only have fallen by 11 per cent * – less than the decrease in cycle use. Despite a large increase in helmet use, the risk of head injury amongst people who continue to cycle has risen, and in some parts of Australia injury rates are at an all-time high. In New Zealand, too, large increases in helmet use seem not to have brought about any reduction in the proportion of serious head injuries, and legislation caused cycle use to fall. Scuffham and Langley, 1997 noted that although there had been a reduction in mild concussions and lacerations, this was balanced by an increase in neck injuries which could be more serious. 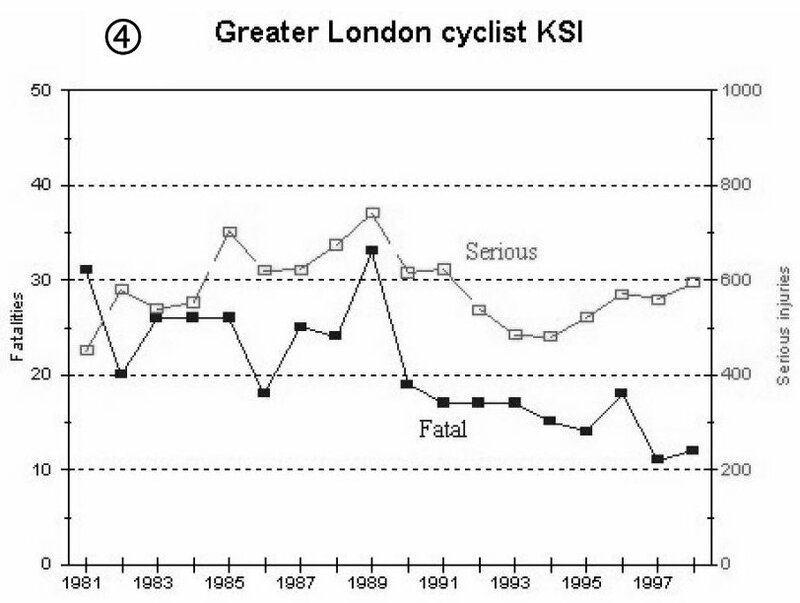 Examination of cyclist casualty data for Great Britain, Greater London and Cambridge shows no evidence of any reduction in serious injuries despite a large increase in helmet wearing by cyclists since the mid 1980s. If cycle helmets are effective in reducing head injury, it seems reasonable to expect that the reductions in injuries would be reflected in the general casualty statistics, particularly in places where helmet use has become significant. There is no indication that this is the case. With more than 2 out of 5 cyclists now wearing helmets in London, it is difficult to see what greater use of helmets would be necessary to achieve noticeable casualty reductions, particularly if the more optimistic predictions for the effectiveness of helmets are correct. The results nonetheless are consistent with other research in the USA, Canada, Australia and New Zealand, none of which has found real-world evidence of any significant reduction in cyclist head injuries in large population samples. It would seem prudent to re-assess the claims being made for the role of cycle helmets in road injury reduction, to ensure that the information being given to the general public is not misleading.